Cretan nature and ecology is diverse. Both the animals and plants of Kriti are unique and well worth exploring. 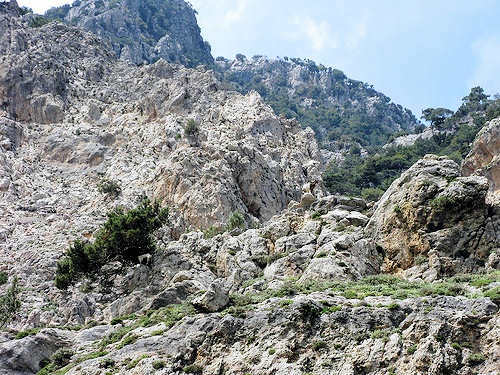 The mountainous terrain in Crete ensures the survival of some very special birds and plant species. Marine life is also rich and varied. The landscapes, shapes and ecology of the island are influenced by the main activities of agriculture and tourism; however there are protected areas and plenty of wide open spaces where nature lovers can discover the hidden treasures of Kríti. Heavy snow on the mountains in winter brings life to the streams and creeks in spring, and an abundance of spring flowers beloved by locals and visitors alike. 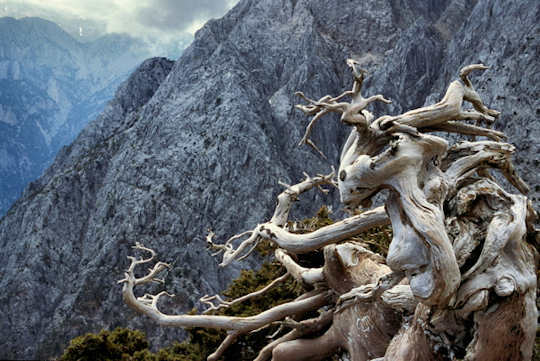 In the mountains and gorges grow plane trees, Mediterranean cyprus pines and maple trees in the rocky terrain, along with trachea pine, kermes oak and carob tree. There are also chasteberry and mastic shrubs, myrtles, strawberry trees and ebony trees, lavender and and the wonderful healing herb known as Dictamo (Origanum dictamnus). 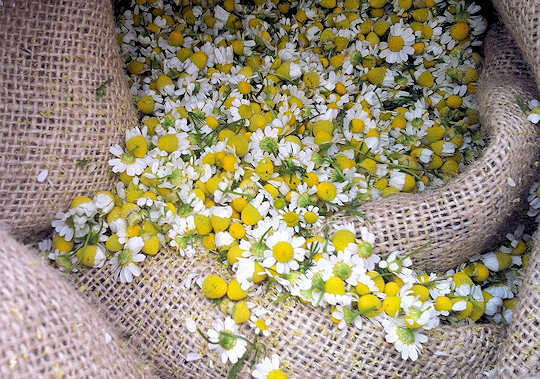 The mountain herbs, such as sage, thyme, chamomile and majoram grow wild and have been savoured for centuries, they hold many natural remedies. The mountain animals of Crete are the Kri-Kri (Capra aegagrus cretensis), (below) indigenous mountain goats now protected. 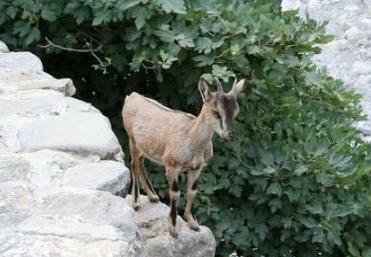 In Samaria National Park (pictured above), the goats are slowly increasing in population. They are difficult for the visitors to see as they are shy and fast-footed, they climb in the highest, steepest mountain terrain and keep out of people's way. The brown goats known as agrimi or wild ones, can only be found in a few places in Crete now. Still they are hunted and destruction of natural places limits their habitat. Other mammals found in Cretan nature include the Cretan Spiny mouse, shrews, hedgehogs, weasels, martens and badgers, mice and bats. In the sea roam fin whales and pygmy sperm whales. Whalespotting tours are available at Paleohora on the south coast of western Crete, where you can also see delfinia dolphins, a sacred animal to the Minoans and still swimming in the waters around Crete. In Kriti there are all types of marine life; fish, coral, shells, octopus, moray eels, scorpion fish, salemas, bream, stingrays, sponges and sea anemones. The Mediterranean is home to much of Cretan nature. The Loggerhead Sea Turtle caretta caretta, is protected and helped by many volunteers in conservation projects. Loggerhead turtles Caretta caretta, Leatherback turtles Dermochelys coriacea and Green turtles Chelonia mydas are protected sea turtles found in Crete. Now to the intriguing story of Cretan nature; the fourogatos Cretan Wild Cat Felis silvestris agrius. 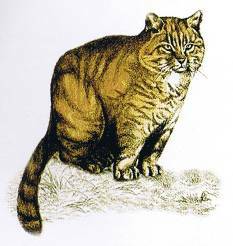 This cat was thought to be extinct but recent reports of sightings have created hope that there may be some of these beautiful felines roaming wild in Kriti. The shy Cretan Martin is a little bit like a stoat or a weasel and has had rare sightings; it is exciting to report that we saw one at Vai Palm Forest. This incredibly beautiful palm forest at the eastern tip of Crete is the largest in Europe. 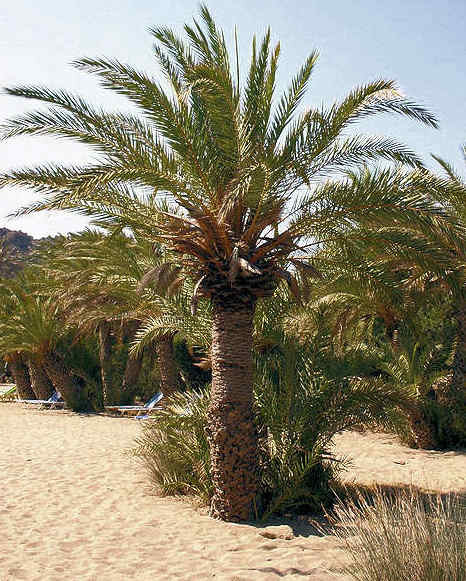 The palms Phoenix Theophrasti, are unique to Crete. The forest borders on Vai Beach, and nestles inland around a fresh water creek in a shallow valley. The area is now protected by the EU and is recovering from destruction. The forest supports a number of animals. The birds of Cretan nature are many and interesting. 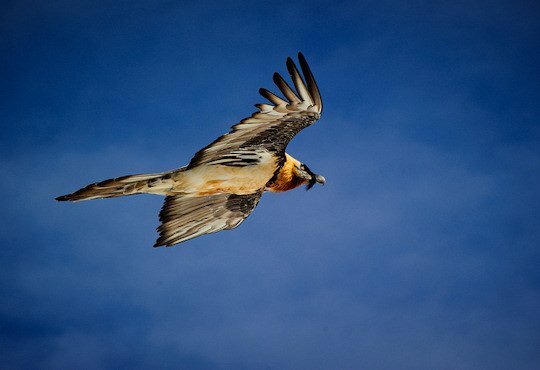 The Bearded Vulture Gypaetus barbatus (see right and below). These birds are protected under the Life program of the European Union. 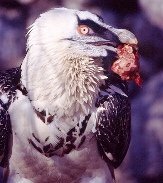 The extraordinary Bearded Vulture is a large vulture which feeds almost entirely on bones, its gut has special ways of digesting bone marrow, and it actively drops large bones from a height to break them down into edible size, this gives its nickname 'kokolas' in Crete. This huge bird has an immense and impressive wingspan. Keep an eye out for this beautiful bird in the mountains and gorges of Crete. The Eleonora's Falcon Falco eleonorae (above), known in Greece as Mavropetritis, is a fast and skillful predator, migrating from the Mediterranean to Madagascar and other islands in the Indian ocean each year. This beautiful bird is under threat. Its habitat on tiny islets is being destroyed or invaded by rats, due to human activity. 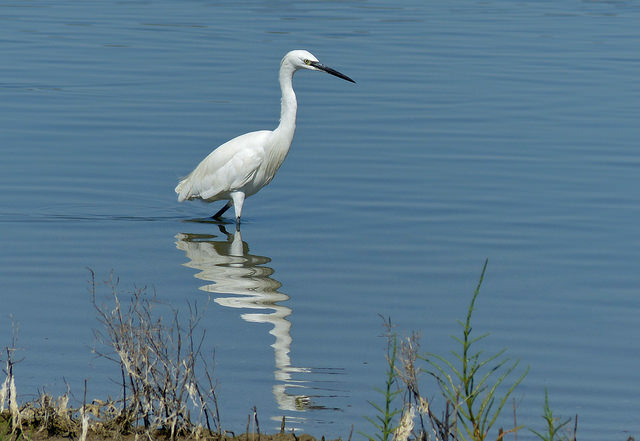 Lake Kournas is a natural freshwater lake in the central west of Crete where many birds can be seen including the Little Egret (pictured above), Kingfisher, raptors and herons. The Natural History Museum of Crete, at the University of Crete in Iraklion, protects the Eleonora's Falcon in participation with other organisations and the European Life program Nature 2003. Visit the museum to learn about the diverse flora and fauna of Kriti. This museum shows a vast range of Cretan nature. A great way to experience the diversity and unfolding panoramas of Cretan nature is to walk the E4 European Walking Path. This path stretches over the Lefka Ori, Psiloritis and the Dikti Mountains, running from west to east across the whole of Crete for 320 km. There is a coastal route and an alpine route to choose from. Want to see more of Kriti? Planning a visit? Wanting hiking maps? Where to find excellent maps of the island for walking, hiking, E4 path and more. Learn about the E4 walk and guide book, and hiking maps of Crete. From Chora Sfakion to Loutro is a 7 km walk, partly on the E4 walking path. Another day walk starts at the top of Aradena Gorge and ends in Loutro, also using the E4 walk along the coastal pathway totalling 8.5 km. It is also possible to walk from Paleochora to Loutro using the E4 pathway, this trek of 47.5 km would ideally take three days with stops in Sougia and Agia Roumeli. Are You Interested in Wildlife Conservation in Crete? 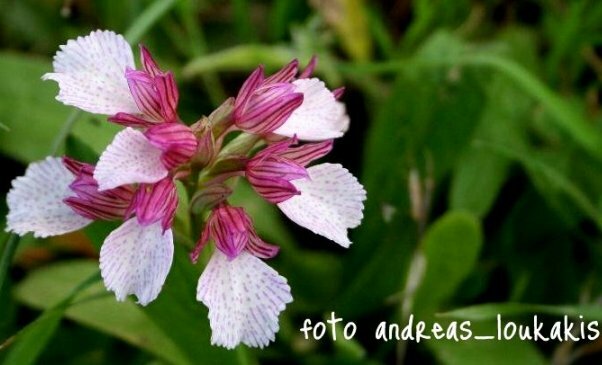 We are all aware of the need to contribute to the health of our planet, to conserve habitat and a healthy ecology for our Cretan nature. 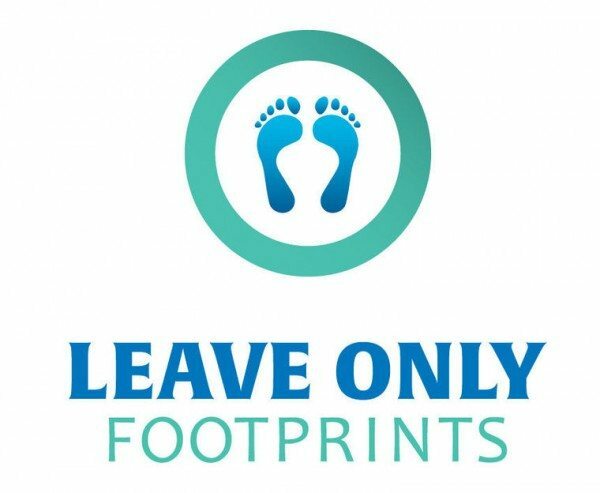 The team at We Love Crete actively participate in ecology programs and make donations to conservation projects. 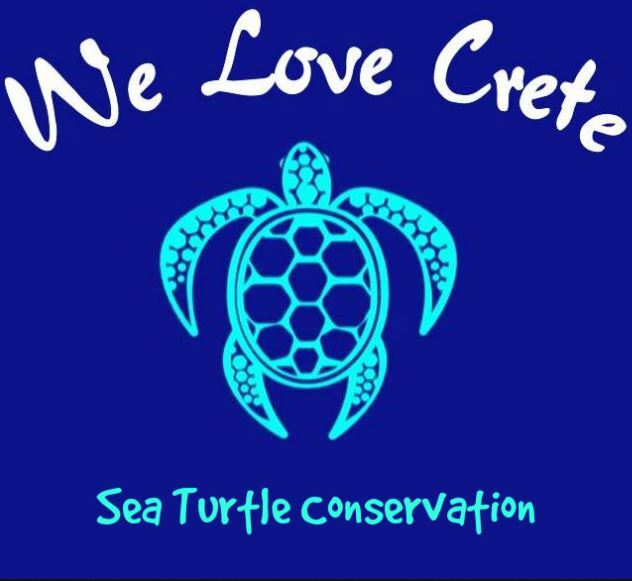 The team at We Love Crete support sea turtle protection as our major charity. Learn more about sea turtles in Crete here and how you can help. If you are interested in getting involved or becoming more familiar with conservation issues in Crete, see our conservation page and our volunteering info. We Love Crete so please take all your rubbish when you walk and don't build those silly piles of rocks. Leave it as you found it and leave only footprints.